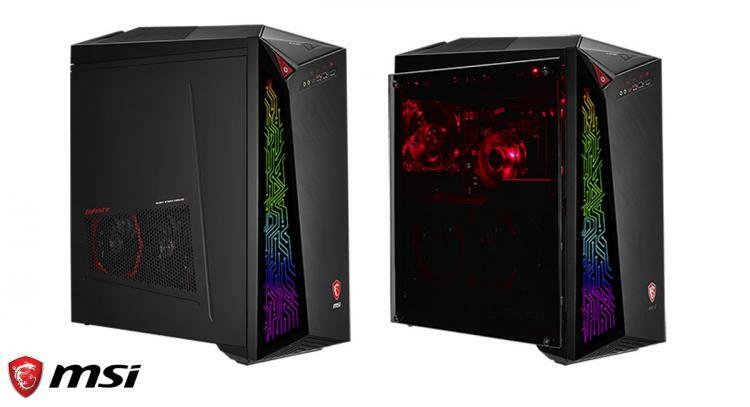 MSI introduces its newest gaming desktop line featuring high-performance gaming hardware – the MSI Infinite A series. Featured at the recently concluded Computex 2017 at Taiwan, the MSI Infinite A gaming desktops are larger than the other existing gaming desktops MSI offers such as the Trident, Aegis and Nightblade Series. Watch the MSI Infinite A teaser video below. - Support full-sized MSI GAMING graphics card supported by motherboard with Steel Armoured PCIe slot. Enjoy the cooling performance of TWIN FROZR VI with MSI GAMING graphics cards. - High-performance 7th generation Core i5 or i7 processor paired with a VR-ready GeForce GTX 1080 graphics card. - Efficient and silent cooling provided by MSI’s exclusive Silent Storm Cooling 3. The most eye-catching feature of the Infinite A is the RGB electric circuitry design in front of the case which is controllable and customizable using the MSI Mystic Light software. There’s also the option to opt for the classier tempered glass side panel giving you a view of the MSI GAMING hardware inside. Unlike the smaller desktop gaming offerings of MSI that’s limited to using small form factor graphics cards, the Infinite A Series features support for full-sized graphics cards. This means it offers support to the VR-Ready GeForce GTX 1080 graphics card or higher if the user decides to upgrade. It supports the latest Intel Core i5 or i7 processor. All these powerful high-performance gaming hardware is cooled by MSI’s exclusive Silent Storm Cooling 3 cooling design offering efficient cooling at low noise levels. The MSI Infinite Series will be available worldwide in June.